Two games hit the ice on Sunday in the World Cup of Hockey. If you were watching football, have no fear. We've got you covered. It was a last minute shock when Henrik Lundqvist was not the starter for Team Sweden. Felled by illness for the day, Jacob Markstrom took the net for the Swedes and held down the fort for a 2-1 victory that featured some minor controversy at the end. What might have been Alexander Ovechkin's second goal of the game in the dying seconds was waved off by officials. After a deflection in front, Ovechkin knocked the puck out of the air and attempted to get his stick on the puck before it went behind Markstrom. Officials cried no goal and replay proved them correct. While Patric Hornqvist was quiet in this game on the scoresheet (though continued to be trouble in front of the net), Carl Hagelin registered an assist on Sweden's second goal, the eventual game winner. Evgeni Malkin was largely silent during the prelims but showed up with an assist when it counted for Russia's only goal, one by Alex Ovechkin. 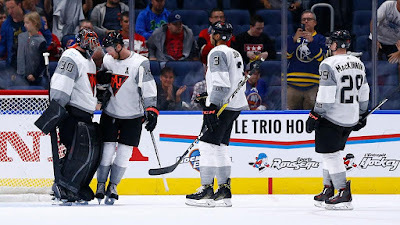 Thought to be the outside favorite going in to the World Cup, the youth of Team North America showed why many people figured them to be the dark horse. Using the combo of speed, possession, and skill they overwhelmed Team Finland for a 4-1 win. Matt Murray was the started for Team North America and he did more than hold the fort down. Stopping 24 of 25 shots he went through stretches where he was more spectator to the action down the ice than a key member of the team. Team North America managed to only throw 43 shots on Pekka Rinne by comparison. The other Penguin playing in this match, Olli Maatta, avoided the blood letting and stayed at even in the +/- column while registering two shots. Pittsburgh native Brandon Saad also stayed even, registering three shots. Two more games fill Monday. At 3:00pm on ESPN2 Team Europe plays Team Czech Replubic. At 8:00pm Team Russia and Evgeni Malkin take on Team North America and Matt Murray, that game also on ESPN2.